Yesterday marked three weeks until the release of The Portland House: a 70's memoir. On January 23rd, it becomes available on the eLectio Publishing website as well as Amazon, Barnes and Noble online and iTunes. As a prelude, over the next few blog posts, I'd like to introduce you to a few random characters in the book. Some will be more significant characters than others, but all played a part in my childhood, whatever their role. Today I'd like to introduce my grade school friend Pat S. I have three friends named Pat in the book as well as my sister Pat, so I try and use last names in the book to keep them straight. This Pat was one of my better friends through the grade school and middle school years. He lived almost exactly one block away, on the 1200 block of Portland. As I allude to in the book, I met him more out of a sense of curiosity than anything. He had a crew cut haircut, and would occasionally stop his bike across the street from our house and stare. Because his haircut and menacing stare unnerved us as new kids in the neighborhood, I think it was my brother Rob who called him "Flathead." It's funny how kids think. Anyway, it turns out he went to my school and over time we met and got to be pretty good friends. I wasn't one much for going over to friends' houses and such, but at school at least, we pretty good friends. I think it was seventh grade or so when Pat's father died suddenly and unexpectedly. As one would expect, Pat was pretty devastated. At the same time, because of my own situation, we suddenly held a bond that we hadn't planned on. We were both fatherless. It is nothing to aspire building a friendship around, but there were some times he confided in me and, well, I did and said what I could, I guess. I had been without a dad for so long, in some ways, I could hardly relate with the emotional shock he was feeling. But, I was there inasmuch as I could be. 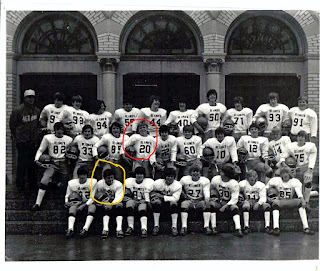 Pat and I were also on the eighth grade football team together. 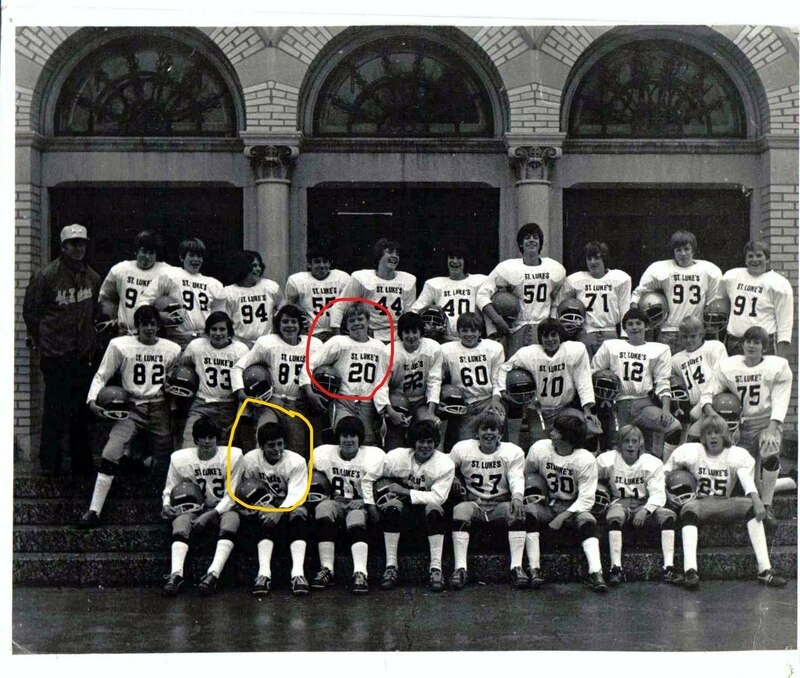 We were both second stringers and both had the same style of cleats purchased at Montgomery Wards. Don't know why I remember a detail like that. He was as tough as nails on the team and played all-out every down. It's how he rolled in sports and in life. Somewhere along the way in grade school, Pat picked up the nickname, Scummy. Some guys just have all the luck with nicknames, I guess. It kind of stuck and became him and his persona. I lost touch with Pat after we both went to different high schools. I did hear that he worked a lot as a sort of roadie/sound/light guy for a few Twin Cities bands over the years which I always thought was kind of a cool gig. But, for the most part we lost touch until a few years ago when we reconnected on Facebook. It is refreshing how the social media world can connect two people who had lost touch for nearly forty years. Anyways, he mentioned he'd read Dirty Shirt and became a fan, which was great news. Little did he know he'd be a character in The Portland House.